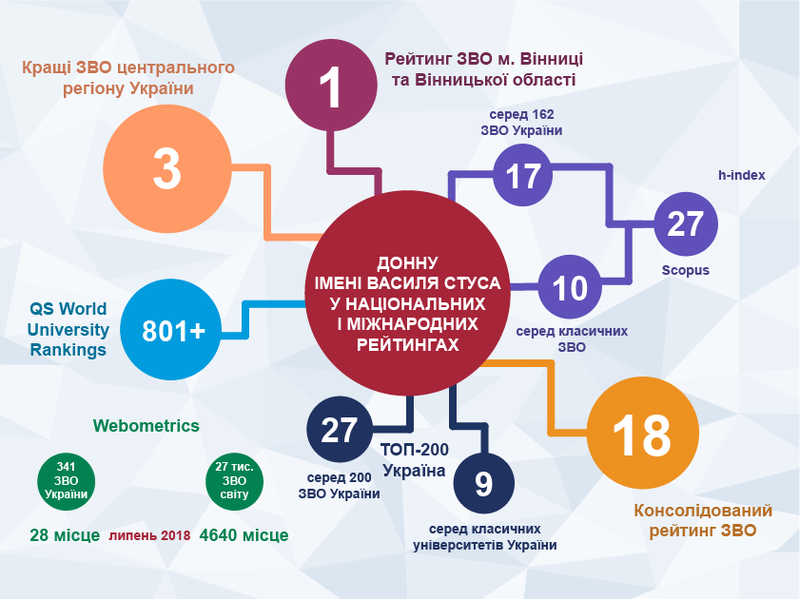 The success of Vasyl` Stus Donetsk National University is reflected in national and international rankings: «Top 200 Ukraine», «QS World University Ranking», Scopus and others. The consolidated ranking of Ukrainian universities includes higher education establishments of III-IV levels of accreditation, as well as 7 subrankings Top-10: “Top classical universities of Ukraine”, “Top medical universities of Ukraine”, “Top pedagogical universities of Ukraine”, “Top private universities of Ukraine”, “Top universities of Kyiv”, and also “Top University Ranking according to Ukrainian Oblasts” and “Top University Ranking according to Ukrainian regions”. The most authoritative university rankings among experts such as “Top-200 Ukraine”, “Scopus” and “Webometrics”, each of which uses different criteria for assessing higher education establishments, are used as basic data for compiling the consolidated ranking of higher educational establishments of Ukraine. In 2018 in the consolidated ranking Vasyl’ Stus DonNU was ranked 18th among 237 universities and ranked 3d place among the best universities of Central Ukraine. Our University is one of the top ten best classical universities of Ukraine. The methodology of the study uses four main criteria: perception of university activities by employers and the general reputation in the academic environment; quality of research and teaching activity; general education quality; international recognition of the University and its presence in the global information space (taking into account Webometrics ranking). In 2018 Vasyl’ Stus DonNU was ranked 27th among 200 universities. QS World University Rankings is considered one of the most influential international annual rankings. It studies higher education establishments from all over the world and displays not only the overall ranking, but also the ranking of individual subjects. Today the study covers more than 2000 universities, and the ranking is calculated for 700 ones. The higher education establishments, which took positions up to 400, are ranked individually, all others – in groups. Six universities in Ukraine were featured in the QS World University Rankings 2018. Vasyl’ Stus DonNU was ranked in group of 801+. The results of the ranking are based on the Scopus bibliographic and abstract database, which is a tool for tracking citation of scientific articles published by the educational institution or its employees in scientific journals. Today, the Scopus database is constantly indexing over 18,000 publications in the sphere of technology, medical and humanitarian science. The evaluation of HEIs of Ukraine was carried out according to the h-index that is a quantitative indicator based on the number of scientific publications and the number of citations of these publications. As of April 2018, Vasyl’ Stus Donetsk National University ranked 17th among 136 higher educational establishments in Ukraine (and 10s among the classical universities) according to the citations in the publications, which are indexed in the scientific base of Scopus. The University has maintained its position both among the classical universities and in the overall ranking. The h-index of Vasyl’ Stus Donetsk National University increased by one compared to last year’s ranking and now it is 27. There is also a steady increase in the number of publications of our scientists and the number of their citations.